A native of the tobacco growing community of Pierce, Green County, Kentucky, Paul Yates Thompson was the youngest of seven children. He graduated from Greensburg High School then enrolled at the University of Kentucky where he received a Bachelor of Science in Civil Engineering in 1958. As an undergraduate student, he was active in the American Society of Civil Engineers, the Arnold Air Society, a Cadet Major in the Air Force ROTC, and was elected to Tau Beta Pi, national engineering honor society. During his senior year and immediately after graduation, Dr. Thompson worked for the Kentucky Highway Department’s Branch Bridge Office located in the College of Engineering . At the same time, he pursued graduate studies in structural engineering. Entering the United States Air Force in March 1959, Dr. Thompson served in the U.S. Air Force in civil engineering and command positions for the next 20 years. He served one year in Vietnam as Executive Officer of the 823rd Civil Engineering RED HORSE Squadron – the Air Force’s equivalent of a Navy Seebee unit. During his tour of duty, Dr. Thompson was awarded a Bronze Star and Outstanding Unit Award for Valor. Following his service in Vietnam, Dr. Thompson became the Assistant Director of the Civil Engineering Research Division and Director of the Civil Engineering Research Facility, Air Force Weapons Laboratory, Kirkland AFB, New Mexico (1969-71); R&D Director, Air Force Civil Engineering Center, Tyndall AFB, Florida (1972-75); Base Commander, Taegu Airbase, Korea (1976-77); and Assistant to the Director of Engineering and Services, Headquarters Military Airlift Command, Scott AFB, Illinois (1977-79). While on active duty, he attended Northwestern University as a Walter P. Murphy Fellow, earning a Masters in Environmental Engineering (1962) and the Massachusetts Institute of Technology earning a Ph.D. degree in Civil Engineering (1968). He also completed Squadron Officers School , Air Command and Staff College , and the Industrial College of the Armed Forces. Retiring in 1979 as a Lieutenant Colonel, Dr. Thompson accepted the position of Vice President and Managing Director of Mirabid-Gray International, a young engineering-construction firm in Riyadh, Saudi Arabia. During Dr. Thompson’s three-year tenure, the firm grew from 500 employees with $50M in projects to more than 3,000 employees and $760M in projects. In 1982, Dr. Thompson returned to government service as the Chief Scientist of the Air Force Engineering and Services Laboratory, Tyndall AFB, Florida , an organization he helped originate in 1972. During this time he was selected as a Senior Executive Fellow at Harvard University . 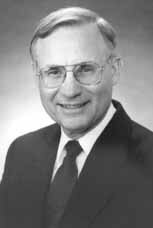 In 1987 Dr. Thompson joined the ranks of academia at the University of Florida (UF) as Chair and Professor of the Department of Civil Engineering. In 1997 he accepted additional duties as the Chair of the Department of Coastal and Oceanographic Engineering, and in 1998 was appointed Interim Associate Dean of the College of Engineering. Since November 1999, Dr. Thompson has served as the Associate Dean for Research and Administration for the UF College of Engineering. The UF College of Engineering has 12 departments, more than 300 faculty, 1600 graduate students and 4,200 undergraduate students, and a research program with annual expenditures of $60 million. In 2000, Dr. Thompson was named Associate Vice-President for Research and Graduate Programs for UF while still holding the Associate Dean’s position for the College of Engineering . He held these two positions until retiring in June 2001. A registered professional engineer in Kentucky , Florida and Maryland , Dr. Thompson is a Fellow of the American Society of Civil Engineers and a member of Tau Beta Pi, Sigma Xi, Chi Epsilon honor societies and the American Society for Engineering Education. His biography appears in “Who’s Who,” American Men and Women of Science and Engineering, the Dictionary of International Biography, and the National Register of Prominent Americans. In his free time, Dr. Thompson enjoys golf, gardening, jigsaw puzzles and reading. He and his wife, the former Gayle Hood, reside in Gainesville, Florida. They have three children, Dr. Lynn A. Carter, Dr. Jeffrey Y. Thompson, and Dr. Michael Keith Thompson, and five grandchildren.